Get an alert and talk to visitors at your door from anywhere. Delivers bright, crisp images day or night. Smart enough to detect a person, then alert you even if they don’t ring. Hear visitors loud and clear. See people head to toe or packages on the ground. If you need help installing Nest Hello, a Nest Pro is ready and waiting. Don’t miss a thing with a Nest Aware subscription. See what happened with up to 30 days video history and 24/7 continuous cloud recording – not just clips. Highlight areas that are importanct to you and receive alerts when something happens there. Create a custom clip or timelapse to download and share with friends, neighbors or the police. ¹Some features, including mobile notifications, video streaming and video recording, require working internet and Wi-Fi. 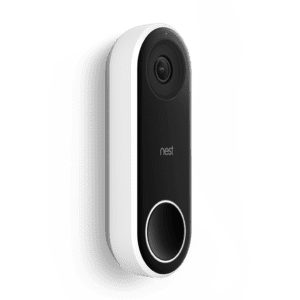 ²Familiar face alerts require a Nest Aware subscription. Familiar face alerts not available on Nest Cams used in Illinois.